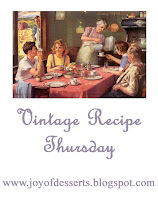 This is my first time participating in Vintage Recipe Thursday! I found this over at grampy and you so I thought I'd join in. Join me on Joys of Desserts blog and leave your link. We have a lot of sweet-tooth dreams come true. Preheat oven to 300 degrees. Combine ingredients and bake in unbaked pie crust for 45 minutes. I know. I wish I had some of my mom's recipes.I am going to see if my mother in law has some.Thanks for the Link. I have the cookbook my Mom used from the 40's. I had it rebound when I worked at the library. I've also got some handwritten recipes that have yellowed over the years. I keep saying I need to scan them in my computer because they are getting so fragile. I really need to do that. I love the Vintage Recipe meme idea, thanks for sharing. Welcome to Vintage Recipe Thursday, A.Marie. I'm so glad you are joining us. I think you are right about your grandma's oven. Most ovens are off, and would need to be recalibrated.